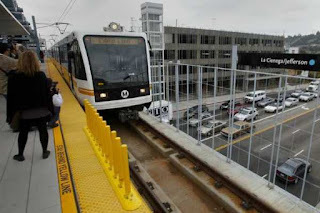 Metro's route to a greener L.A.
LA Metro is visiting the Green Tent! 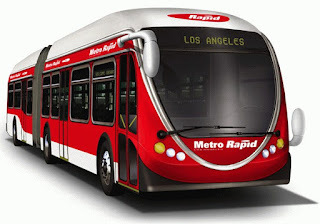 The Los Angeles County Metropolitan Transit Authority operates the nation’s largest fleet of compressed natural gas buses – 2222 vehicles providing safe, clean, reliable, on-time and courteous service. About 1.4 million passengers board Metro buses and trains every day. They'll be lots of give-aways, including Metro to Be Green Canvas Bags, Recycled Pens, Pop Up Buses/Trains and Bike Pocket Guides and Maps. Total pollutant emissions from bus and rail operations decreased 20 percent – that’s 362 tons -- between 2010 and 2011. Over the last decade, as Metro switched from diesel to CNG buses, air toxic pollutants were reduced by more than 92%. LA County residents taking transit offset about a billion passenger car vehicle miles each year; this translates to saving an estimated 420,000 metric tons of CO2 emissions annually! The American Association of State Highway Transportation Officials recently recognized Metro for its vision and leadership in the area of sustainability and environment. Metro's Environmental Institute, developed to better create environmental and sustainability-related awareness, offer energy and resource management training programs, and better manage our hazardous materials and waste, was recently recognized by the National Training Institute as a model program for other transit agencies across the nation. 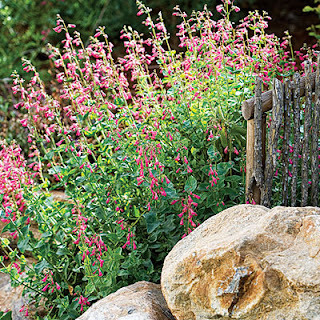 January and February are great months to begin planning and starting your Spring and Fall plantings. In addition to information, the UCCE/LA County Master Gardeners have packets of seeds and free seedlings to give away. 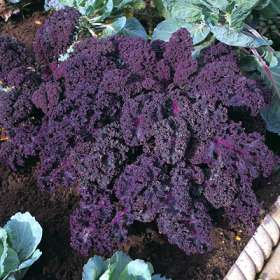 Red Russian Kale loves the cold weather we've been having. Edible Chrysanthemum, Shungiku. This Mediterranean native was taken to the Orient in ancient times, then made it to the US from Japan. Its tender edible greens and flowers have a unique zesty flavor. Calendula "pot marigold" is an edible flower, easy to grow, blooms for months, also a long lasting cut flower. Will reseed in your garden...this is a good thing! Bloomsdale Spinach grows best during cool weather. Harvest young. We also have seeds so take a package and keep sowing all winter/spring long. It's Master Gardener Sarah's favorite spinach. 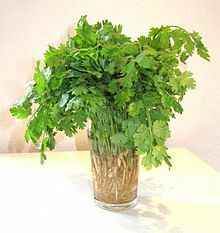 Cilantro/Coriander "Santo" is a good container variety. Can also grow inside in a bright sunny window. Visit the Green Tent on Sunday, January 20, to learn about Feed-in Tariff, a new LADWP solar buyback program that launches this February. FIT will provide 100 megawatts of clean, local, renewable energy to neighborhoods throughout the City of Los Angeles. As the largest urban rooftop solar program of its kind in America, LADWP's local investments will generate 4,500 jobs and $500 million in new economic activity for the city. Green Tent guest Open Neighborhoods has the details. 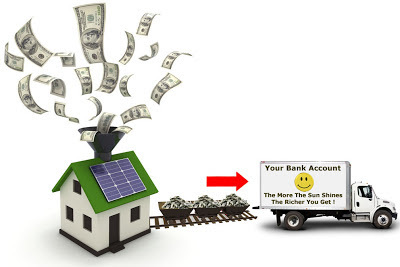 Learn how you can receive up to $0.38 per kilowatt hour during the first six months of the program for electricity generated from sunshine on your roof. Find out how to submit your property application for an LADWP power purchase agreement. View an instant satellite evaluation of solar energy potential on your property. 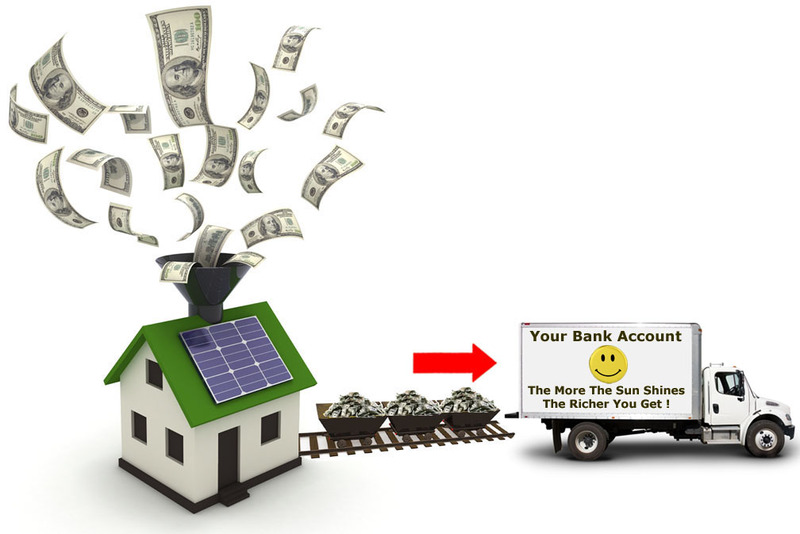 Discover how you can benefit from the largess even if you don't own a rooftop. 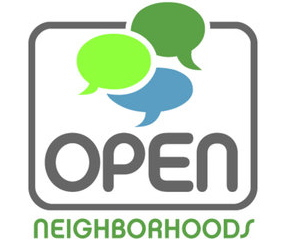 Open Neighborhoods is dedicated to connecting and informing local neighborhoods with social networking services, open Internet access and clean electricity. Proudly serving Southern California neighborhoods. Are you interested in changing over to a low care, eco-friendly landscape? It's hard to beat the plants that were here before we even discovered California. You can create a little haven to help feed and protect our local and endangered butterflies, native bees, hummer and other birds. 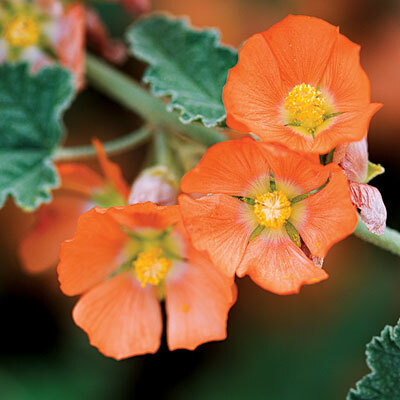 You can easily add natives into your landscape as there are varieties adapted to all types of soil, sun and watering. How about a colorful and ever changing wildflower meadow instead of that all green lawn? Come by the Green Tent to see and learn about some of our beautiful native plants. Deni Friese has been studying and planting natives since the'70s and can tell you from personal and professional experience how to choose, plant and maintain our wonderful native plants. Denise "Deni" Friese, ecologist and owner of Eco-Friendly Custom Landscapes, is a trainer for the LA County Master Gardener program and president of the Culver City/Westside Garden Club. She teaches and consults on many aspects of landscaping and low-water irrigation. 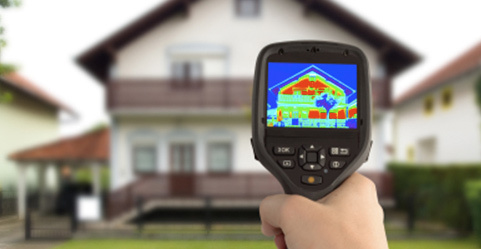 Are some rooms in your house hotter or colder than others? Do you seem to pay a lot more for gas and power than your neighbors and friends? Does mold keep rearing its ugly head? Perhaps your house needs a check up to test how healthy and efficient it is and to identify projects with the biggest payback. An energy efficient home is a more comfortable home, with fewer drafts, lower energy bills, higher resale value and healthier indoor air quality. 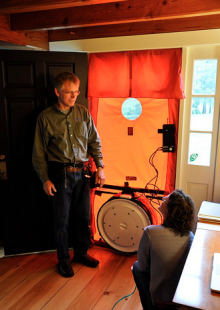 Energy Upgrade Solutions will explain the home audit process and some of the sophisticated equipment used. They'll also provide information about incentives currently available for retrofitting and weatherizing homes. There are numerous sources for rebates and incentives, particularly from Energy Upgrade California, a state program that is administered and financed by the cities, counties and utility companies, including the LADWP and the Southern California Gas Company. A homeowner can get up to $4,000 back in rebates, along with other incentives for getting an energy upgrade for their home. Palisades’ residents Scott Kelly, Susan Sullivan and Chris Hope started Energy Upgrade Solutions as a response to the need to retrofit the existing stock of homes in Pacific Palisades and the Westside. Its primary focus is on energy upgrades and sustainable green building.